We’re sure you’re well aware that winter is coming in the Northern Hemisphere. So it’s either time to start throwing on those layers and prepare for the cold season ahead, or if you’re more inclined, you can skip the winter clothes shopping and take a locum tenens assignment in the U.S. Virgin Islands where the warm days never go out of style. Now we’re not diminishing winter by any means. In fact, we love winter. Just check out these top ski resorts in the Rockies we wrote about recently. If that doesn’t get you excited as ever about the upcoming ski season then we don’t know what will. However we do know there are plenty of people out there who’d opt for year-round, sunny Caribbean weather instead. The following list of top locales and experiences in the U.S. Virgin Islands is for anyone who’d rather be sipping a piña colada on the beach than carving the slopes in the Rockies. We’ve written about Magens Bay more than once. And it’s for good reason. The whole area is magical. It tops many lists as far as beautiful beaches the world over are concerned. The waters are calm, too, which means the bay is perfect for tons of sea-based activities. 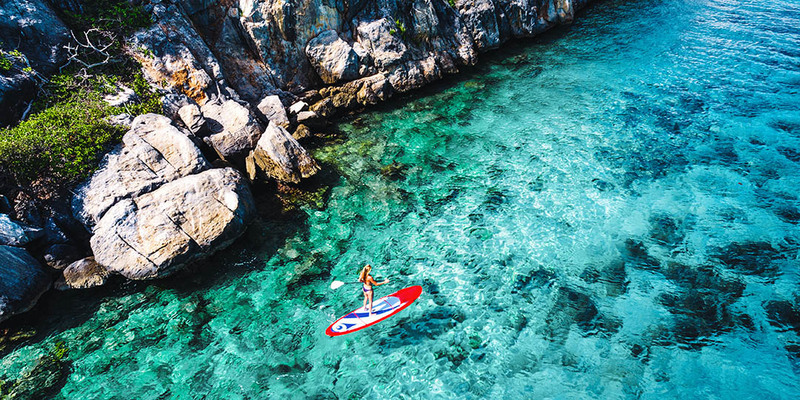 Great pastime: To top your Magens Bay trip off we suggest you rent a kayak and venture out into the serene waters where you can catch sublime seascapes and landscapes from not too far offshore. Just as poetically beautiful as Magens Bay but with less crowds is Secret Harbor Beach. Maybe because it’s a secret? Nah. It’s not as busy as Magens but it’s definitely no secret. You can’t keep locals and tourists away from scenes with humming Caribbean waves and rolling green hills for too long. Great pastime: Ask around town and most people will tell you to head to Secret Harbor on a clear day and plan an afternoon of snorkeling. Diving is superb along these rocky coastlines. You’re catching on that tropical beaches and bays will permeate most of this list, aren’t you? You’d be right in that inference. Point is that’s what makes up these islands. They’re diverse but only insomuch that an impeccable tropical island can be diverse. And Coki Point is as eclectic as it gets. Much like Secret Harbor this small yet lush bit of coastline is fantastic for snorkeling. Plus there are plenty of activities and booths around as well as food trucks to keep you entertained and well fed on this stretch of coast for an entire day. Great pastime: Rent a jet ski on a less crowded day. You’ll have a blast ripping through those waves unencumbered all while admiring the beauty that is Coki Point. Charlotte Amalie is THE iconic town to visit in the Caribbean. As a matter of fact it’s the capital and largest city of the U.S. Virgin Islands, too. It’s much of what you’d expect: there are colorful, colonial buildings, old cobblestone streets and tons of history in every step. (Visit all three quarters in Charlotte Amalie for a glimpse into the origins of this bustling capital: Kongens Quarter, Dronningens Quarter, and Kronpindsens Quarter.) But that’s part of why you want to visit, right? Not only for the tropical breezes but for the magic of the Caribbean ambience, too. Great pastime: If you truly want those stupefying views of St. Thomas then take the Skyride to Paradise Point. It will cost you $21.00 for an adult pass and $10.50 for a kid’s pass. The passes include unlimited rides all day to the 700-foot tall observation point where you can see lovely panoramic views of Charlotte Amalie and then some. Great pastime: You guessed it, hiking to the Annaly Bay Tide Pools. The adventure itself is in getting to the tide pools. Along the way you’ll encounter all the vibrant rainforest scenery that St. Croix is known for. The relaxation and pure euphoric state comes once you dip into the pools. Did you know that Virgin Islands National Park covers roughly 60% of St. John? The park itself holds many natural treasures. There’s Trunk Bay, Cinnamon Bay and Hassel Island that are not to be missed. Plus you’ll find Danish plantation ruins wrapped up in quintessential rainforest landscape throughout the park. Great pastime: Go for a hike, any hike. Truly, the best thing to do on St. John is to immerse yourself in nature. The park is filled with 22 nature trails, everything from an hour-long stroll to a full-day hike. Here’s a list of hikes you can take. There you have it. The U.S. Virgin Islands are replete with breathtaking views. And we’ve only provided an iota of possible experiences. The rest is up to you. Find a physician opportunity in the U.S. Caribbean by clicking the orange button below then fill up your itinerary with all these tropical adventures and more. If you have your own set of favorite locales then please feel free to mention them in the comments below. We’d love to hear your thoughts!